the pink toque. 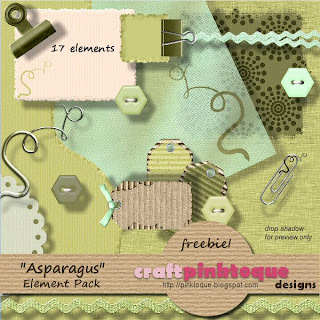 a craft blog: Asparagus Elements are Ready! To keep with my "Asparagus" theme (check my two previous blog posts for the paper pack #1 and paper pack #2 freebies released already!) I made some embellishments to go with the asparagus papers! These turned out pretty well I think -- I really love working with Photoshop! Take a look at the "Asparagus" Element Pack and see what you think! And if you need the paper, you can download paper pack #1 here (linen based papers) and paper pack #2 here (random designs in the asparagus colours.) Whether you pair these embellishments with the paper sets or not, they'll complement your scrapping well in any green, brown or beige theme you've got going! The element pack comes with 17 fantastic embellishments for you to enjoy. And as always, in high quality 300 dpi resolution. I hope everyone has had a great long weekend! Grab the "Asparagus" Element Pack HERE and be sure to drop me a note with what you think :) Enjoy the rest of your day! Thank you! Your blog post will be advertised on the DigiFree Digital Scrapbooking Freebie search engine today (look for timestamp: 05 Aug [LA 12:00am, NY 02:00am, UK 07:00am, OZ 05:00pm] ). cute kit! Thank you so much! very cute kit! thanks for sharing!